1. The Bill for Corn to be carried into Ireland, and for Customers. 2. The Bill for buying of Wools by the Stapler and Clothier. L. 2. The Bill for Tenures in Capite. 3. The Bill for the Sheriffs in England, - Jud'm. 2. The Bill of Tin-works in Devon. 2. The Bill for the Sacrament of the Altar. L. 1. 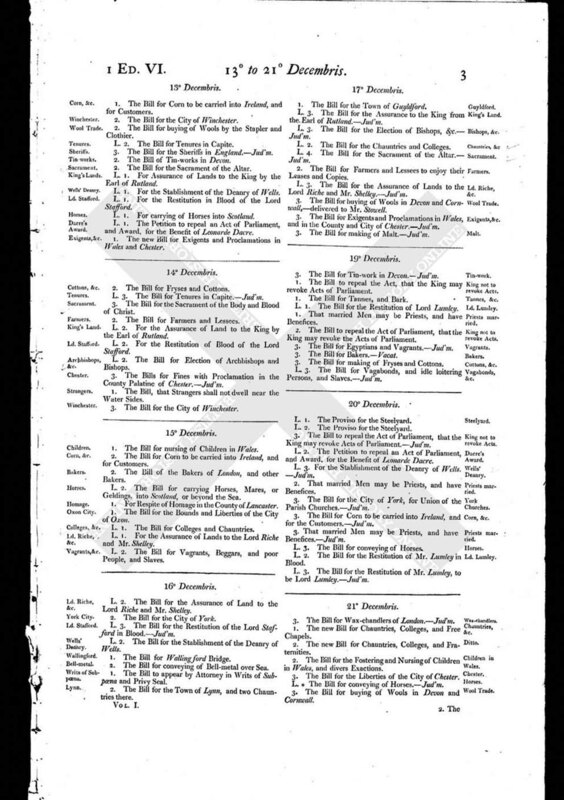 For Assurance of Lands to the King by the Earl of Rutland. L. 1. For the Stablishment of the Deanry of Wells. L. 1. For the Restitution in Blood of the Lord Stafford. L. 1. For carrying of Horses into Scotland. L. 1. The Petition to repeal an Act of Parliament, and Award, for the Benefit of Leonarde Dacre. 1. The new Bill for Exigents and Proclamations in Wales and Chester.